Today I ran my longest training run of the year. I ran my very own private marathon at Mohican State Park. 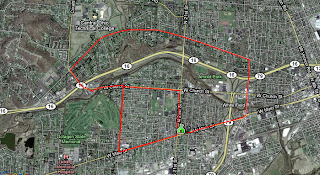 This was my last (and longest) training run before the 2010 Indian Run 60k, in 2 weeks. The night before, I headed to Newark and called my buddy Dan to see if he wanted to join me on a night run. He was in town for the weekend so we met up and ran 7.5 miles around the west end of Newark with our headlamps. I wore my VFF's even though my feet were still pretty bruised from last weekends run @ Mohican. This morning, I woke up around 5am and got everything ready to head up to Mohican. Due to my bruised feet, and painful stroll around Newark last night, I decided to run in my Brooks Cascadia 5 shoes today. I've only wore them 2 or 3 times this summer, so they still kind of have the new smell. I used my CamelBak since I was going to be running solo and didn't feel like dropping water at various locations. The plan was to park at the covered bridge and keep a gallon of water in my car for refills as I came back through off of each loop. I made it to Mohican State Park around 7am and found that the covered bridge was still under construction. 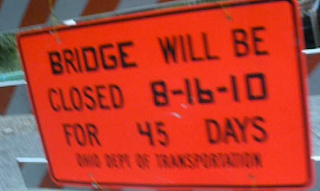 This forced me to drive around the construction to the back side of the bridge and drop a gallon of water. Due to the construction, I decided to focus all of my running on the Orange loop. This little "water drop" detour took me about 30 minutes. I made it back to the campground A parking lot and started running towards the covered bridge. This was a 4 mile run along the river. It was very early in the morning and the river had a nice fog hovering over it. It was very relaxing! When I made it to the covered bridge, I didn't fill up my CamelBak, because I hardly used any water after only 4 miles. I simply turned around and headed back to the campground A parking lot for a total of 8 miles. When I got back to the car, I packed a bunch of nutrition bars for my 15 mile loop around the orange loop. I headed up the switchbacks along RT 3, and took a relaxing stroll through the woods. I came upon a few mountain bikers and hikers along here, and nothing too adventurous happened. I just let my mind wander from thought to thought as I shuffled over the roots and rocks. I made it to Hickory Ridge and kept on moving. I didn't even stop to get some fuel or anything, I just strolled right on through. Somewhere after here, I turned on my iPod and listened to some music. It helped me to pick up the pace a little bit. It's amazing how music can take your mind off of the mundane "left, right, left, right". I had a few startling moments as bikers would come up behind me and yell right before they got to me. I think I yelled at one dude (politely of course) about it. It would be much better if you yell when you see me up the trail rather than waiting until you get 4 feet behind me and say "COMING THROUGH". Towards the end of the Orange loop I ran into a Mohican runner named Ron, but I forget his last name. I'd seen him at various races here at Mohican, and we were both wearing our "Forget The PR 50K" shirts. We looked like twins. :) We traded greetings and kept on moving; he was going the opposite direction anyway. I made my way down the backside of the Orange loop to my gallon jug of water and filled up my CamelBak. It was pretty low by this point and the warm, crisp water tasted great actually. I decided to crush the gallon jug and stick it in my backpack so that I didn't have to drive all the way back around just to pick it up. When I got back to the car, I chugged some gatorade, ate some of my packed lunch (PB & J, Cheez-Its, Granolla bars, etc..). I was at mile 23 or so by this point, so I had 2 miles to go. My goal today was to run 25 miles... I then got to thinking, why not just make it a marathon!? I thew my CamelBak on again and headed down to Campground A. On my way down there, I saw Ron walking through the campgrounds as it looked like he was pretty well spent from his run today. I slowed down and walked with him for about a mile. He took me on a path I'd never been on before. It was great! We traded stories and talked about various things. It's amazing how many people we both knew, and even more amazing that we'd never (officially) met one another until today.